Possible links between an allegedly corrupt police officer and the investigation into the murder of a Welsh private investigator have been highlighted by the home secretary. Theresa May told MPs the information was uncovered in the Ellison Report into the police investigation of the murder of Stephen Lawrence. 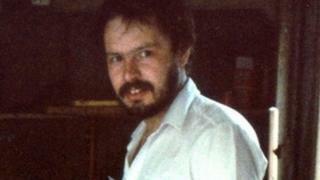 Daniel Morgan, 37, from Llanfrechfa, Torfaen, was found with an axe in his head in a London pub car park in 1987. An independent judge-led panel of experts is reviewing the police handling of Mr Morgan's murder. It is examining claims police corruption prevented a conviction, despite five investigations. Mr Morgan's family believe he was on the verge of exposing police corruption when he was murdered. They have campaigned for whoever killed him to be brought to justice. Mr Morgan's case came up in the House of Commons as Mrs May announced a judge-led public inquiry into the work of undercover policy prompted by a review of the case of Stephen Lawrence. The 18-year-old was stabbed to death in an unprovoked attack by a gang of white youths in south-east London in April 1993. A review by Mark Ellison QC found that a Metropolitan Police "spy" worked within the "Lawrence camp" while a previous inquiry into matters arising from his death was under way. Mrs May described the findings as "deeply troubling". She told the Commons: "Ellison also refers to possible links between an allegedly corrupt officer involved in the Stephen Lawrence case - DS Davidson - and the investigation into the murder of Daniel Morgan. "Ellison finds that the Daniel Morgan Panel may therefore uncover material relevant to the question of corruption. "And so it is key that the Daniel Morgan Panel continues its important work." Mr Morgan's mother Isobel Hulsmann, from Hay-on-Wye in Powys, met Mrs May at the end of 2011 to pursue her campaign for justice. Mrs May has previously said that the Metropolitan Police had already "admitted that police corruption was a 'debilitating factor' in the original investigation". A trial of four men charged with Mr Morgan's murder in 2008 collapsed in 2011, following alleged failures by the police and prosecutors.